Okay; I know this is a departure from my regular type of article, but if I can make just one person think about airbags, I will have achieved my objective. Airbags are designed to save lives, and they do, tens of thousands of them. Maybe hundreds of thousands. But if you don’t remember they are there, they can kill you. I was reminded of this a few days ago when a young girl in Malaysia needlessly lost her life. And the car wasn’t even in a real accident. The driver, her brother, spotted a large bump in the road, braked hard and very late, and when the car hit the bump the airbags deployed. Afterwards, the girl, who had been unbelted in the front of the car couldn’t be found. She’d been propelled by the force of the airbag through the gap between the front seats, and smashed into the rear seat. They found her crumpled up on the rear floor. She was unconscious but alive. So two passing motorcyclists propped her up between them and took her to her home, which was close by. But sadly she died later on the way to the hospital. And in third world countries, never assume an ambulance will magically appear. If you happen to be the one injured, expect to by taken by car or motorcycle to the nearest clinic by some caring passerby. If you’re not conscious, there’s a good chance no one will do anything other than stare. And when one person stares, two hundred will join them. Staring apparently is contagious. But back to airbags. It’s important to remember that for them to work as intended, they have to deploy in less than a twentieth of a second, and are expelled at over 300kph. They are designed to stop an adult driver’s head and upper body smashing into the steering wheel, and an adult passenger’s head and upper body smashing into the dash. Seat belts won’t do this. They only go around one shoulder don’t forget, so your body can still move a long way forwards; plus, the neck is sufficiently flexible that your head can easily reach the steering wheel. Now, imagine where a child’s head is compared to an adult’s. The airbag is going to hit the top of the child’s head. Sad to say, children have been decapitated by airbags. Let me say again. Airbags can kill. Children should never be in the front seat. … and there is now evidence from the US that the presence of a passenger airbag is enough to make parents seat their children in the rear, to protect them from airbag associated injury. Now, most likely you’re an adult so you think you can forget about airbags. But adults too need to remember them. Tired passengers have a habit of putting their feet on the dash, reclining the seat, and dozing off. Bad plan! 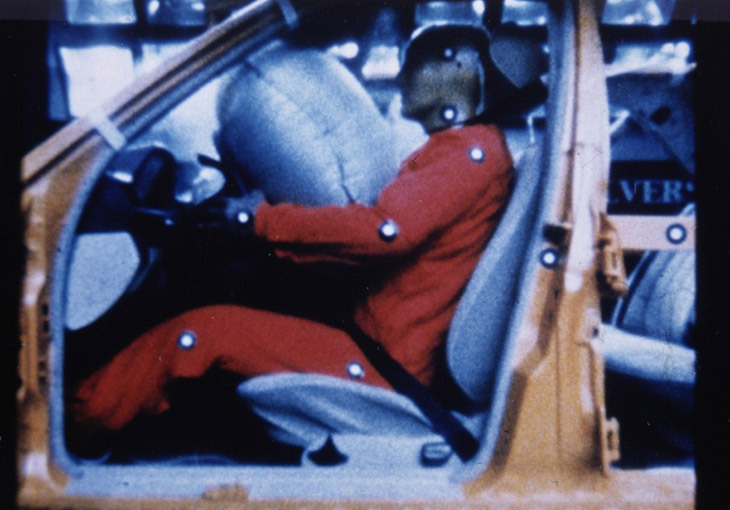 In a serious accident, you slide out of and under the seat belt – propelling you rapidly forwards – while the airbag deploys against your feet pushing you rapidly backwards, and within a fraction of a second it has pretty-much pushed your feet into your face, breaking almost all of the bones in your body. Not many people survive this experience, and I’d guess those who do, may wish they hadn’t. Again, the message is clear. Be aware of the airbags. Don’t put your feet on the dash. Personally I think there should be a very visible warning. I know; not aesthetic, a bit scary, blah blah blah. But they are dangerous explosive devices that need a certain amount of respect. That almost invisible molding in the dash that says something about “SRS Airbag” is useless. Who knows what SRS means anyways? As a driver, I find there are times – especially in this part of the world – when I have to lay down the law. My car, my laws. If you don’t like them, take a taxi. I stupidly neglected my laws the first time I took people in Bert. A friend and her five year-old nephew jumped in the front seat. I protested. But it was the usual story “Oh, but we’re only going to the village.” My sarcastic comment about having an ability to predict the future was lost on her so off we went. And sure enough, as we entered the village a stray dog ran into the middle of the road, so I instinctively hit the brakes. As I did that, I could see the little lad’s head accelerating towards the glove box, so I immediately lifted off the brakes. Better to kill a dog than injure a child. Luckily the dog ran back so no harm was done to anybody or anything. But my rules will not be broken again. I also have to insist that rear seat passengers are belted-in. I often have to tell them to belt up too, but that’s a whole different bouilloire de poissons. Many times in serious accidents, the front seat passengers are decapitated when the unbelted rear seat passengers come flying through the air head first towards, and often through the windshield. When I started this article, I was going to write much more about road safety – or the lack thereof – in this part of the world. But I’ll save the rest for another time. I don’t want to detract from the main message. This article is about airbags. I’ve said what I wanted to say. Be aware of them. Position yourself correctly, upright in the seat. Keep the kids in back. Or, the airbags may just kill someone. And that might be you.